We live in the country and enjoy feeding our birds in the winter. Not only do we get squirrels, but this year we got a new little friend! We have a feeling he is living under our deck for the winter, and enjoying the birdseed buffet. We see him once a week during the mid morning hours. 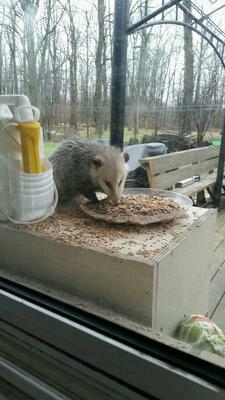 Thank you for sending your great picture of your little Possum visitor. That's a cute little fella, and I'm sure our readers will enjoy this as much as we did.